A Page From the Kontos Cookbook… Add Spice to Your Life with Chicken Buryani - Kontos Foods Inc.
1. Rinse and soak rice in temperate water with salt for ½-hour, then drain. 2. Cover rice with cold water (1-inch over the top of the rice) and bring to a boil. 3. Reduce heat, cover and cook until water has been absorbed. 4. Heat oil in frying pan, add onions, shallots, garlic, and ginger. Sauté until golden-brown. 5. Add chicken and sauté for 4 to 5 minutes. Add the remaining spices and stir for 1 minute. 6. Add yogurt and simmer for 1 to 2 minutes. 7. Add sugar, raisins and par-cooked rice. 8. Cover pan and continue to cook over very low heat for 10-minutes. 9. Remove from heat, allow to rest for 5 minutes. 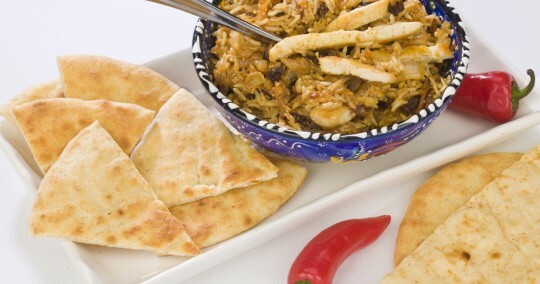 Serve with warm slices of Kontos Kulcha Nan.